In this chapter, this story really leaves us hanging! It’s a great one for real investigation! There are two purposes of the story: the first is to investigate closed systems. Anything that happens inside uses up only the materials in the jar, because there is no access to the outside world. The second purpose is for students to understand that air has mass and contains the materials that plants need to make their food and build their structure. The sample chapter also includes the Table of Contents, Preface, Introduction, and Index. The Seedlings in the Jar can be used to teach about bontany related concepts as well as the conservation of mass. My 8th grade students still think the mass of the jar will change as the plant grows. We spend time discusses the process of photosynthesis, how the atoms are rearranged, and how the contents inside the bag may change, but be the mass does not. A lot of science can be taught from this one story. 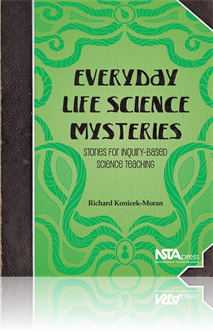 I would also suggest that you use the Everyday Science Mysteries in conjunction with Keeley's formative assessment probes. A very effective combination.